Not bad at all, though there's something about his shoulders which just looks unnatural and wrong, can't quite put my finger on it, though. Ooo I love the icy blue sky horizon background on the first render of Goku. Definently a keeper. Your Goku is looking up as well. Got a side/perspective of him? As for your Roshi map, it's always as spick and span as ever . Good luck when you start to tackle the staircase and upstairs relations if you haven't already . 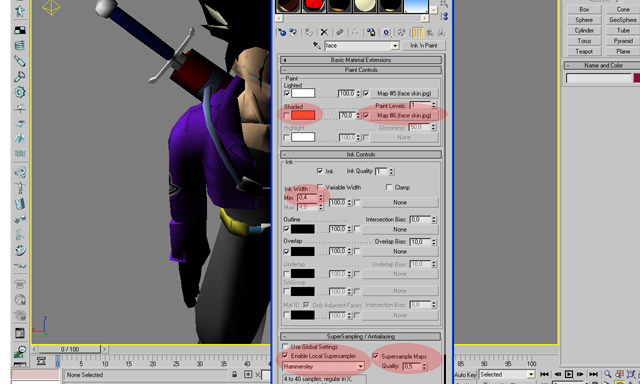 As you could see when you opened the pictures, this guy works for another mod already: DBZ Hood. 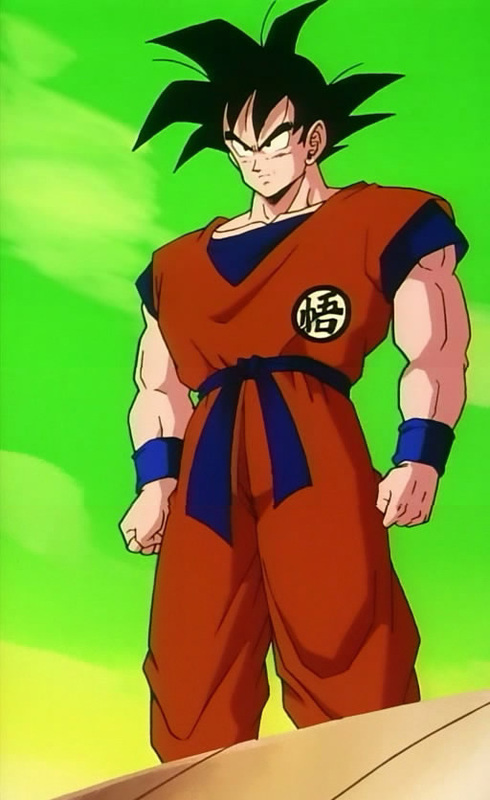 Does Goku really have no hips and such a small waist? 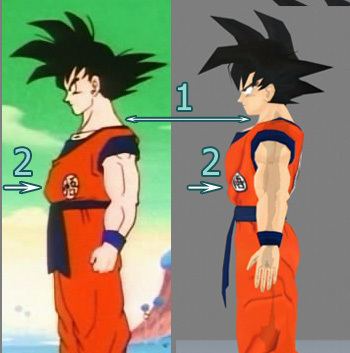 Forza wrote : Does Goku really have no hips and such a small waist? He doesn't. It's exactly what is bothering me about the model as well. Otherwise it looks pretty solid. I think the belt (sache ?) needs to be moved up the body a bit, it seems to far down. maybe that would resolve the wierd lack of hips issue. You are underestimating other people's eye for details and for accuracy that you might have missed especialy Zeth's eye for those things XD. Some guys here know even more then just Frieza saga Goku, just listen to crits they can really help out. By your refs, the waist is too thin, belt is too thick plus it should be raised a little. I'll try and make a drawover for you according to those refs you posted. couldnt match it perfectly to the perspective shot but it's easy to see the proportions issues. There's one big thing I'm sure GokuSSJ has realized. Goku in the Namek Saga is just plain chubby. He's wider than typical and puffier in the stomach region. I'm sure GokuSSJ has also used far more refs than just the few he showed. It's off to the right foot in a great direction for a Namek Goku model . The problem with the waist region that most people see was probably a mis-calculated call of judgement. I imagine that the GI torso was modeled to reflect the hang that occurs over the belt (thus making it look about half-size). After that was applied, it seems as though the original belt size was used without regard to the planned overhang specs. At least that's my theory. This results in a slightly larger upper waist line whereas it probably was designed to compensate for fold push. SV's drawover is pretty dern neat (man, you must love your new tablet ) and has some good applicational use. As we all know though, basing a character only on one particular ref or small set of refs in a single episode is foolhardy. FOV, angle, and lack of distinct depth perception can be quite tricky aspects that have to be taken into regard when judging shapes and proportions. Additionally everyone knows that wind, battle length, travel, and general fatigue play roles in hair/clothing position and ruffle-ness. Here's a simple mockup comparison between the ref's posted and the almost front position as well as some extra refs I hope will help out in determining your perspective average . Of course everyone remembers this gem. O and Goku try to update DBZHOOD page with new models new maps or videos or something...it has past 4 months we need UPDATESSSSSSSSSSSSS!!!!!! Sugar & Cocaine wrote : O and Goku try to update DBZHOOD page with new models new maps or videos or something...it has past 4 months we need UPDATESSSSSSSSSSSSS!!!!!! Hey man, he gets hassle enough at his own forums, don't hassle the man here aswell. Like any mod, they'll update when they update. If you would have payed any attention to the subject matter of this thread, you'd know GokuSSJ is obviously hard at work on DBZHood.. I can acces the site. Not the forum. Well this will sound off topic but yes we have some problems with our PHP server. We had this problem by many times due to our host. Now is back online. Regarding Android 18 going to start to rige her tomorrow so let me know if you find something wrong with it. Hair from the side looks strange.. Sorry I can't explain better than that.